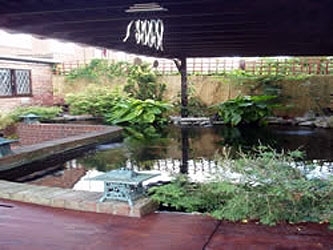 Extended from a kidney shaped 2,500 gallon pond in 1995, the current ‘L’ shaped pond holds 6,950 gallons, including filters. 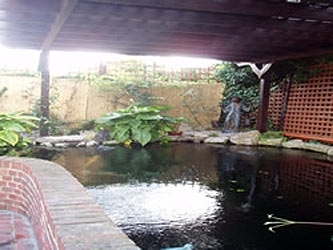 Constructed in concrete blocks and fibre-glassed walls the pond is 6ft deep rising to 4ft at the original end. The filters are fed by two 6 inch bottom drains, firstly passing through a purpose built fibre-glassed settlement chamber with 15 brushes, before circulating in a 4 bay square design filter. The first three of these bays comprise Japanese matting, while the forth has Alfa-grog. An ITT Marlow pump returns the water to the pond via a Lacron 24 inch sand filter, a Crystal Bio Shower filter, and a single 55watt UV light. The pond is also fed by two shallow venturi’s and one deeper return pipe. 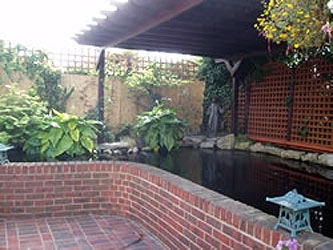 The pond is heated by a gas boiler situated adjacent to the pond at the back of the owner’s garage. In 2008 the original gravity fed skimmer was re-designed into a pump driven mechanism which now feeds a free-standing compact sieve before returning to the pond. A Hi-blo 40 air pump adds the required air to both the pond and filters. The system automatically tops-up through a Devon purifier into bay four. 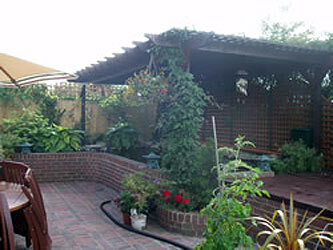 The pond is covered by a wooden Pergola (re-built in 2008).